• Clients – Ian Taylor & Company, BBC Chartering & Logistics. 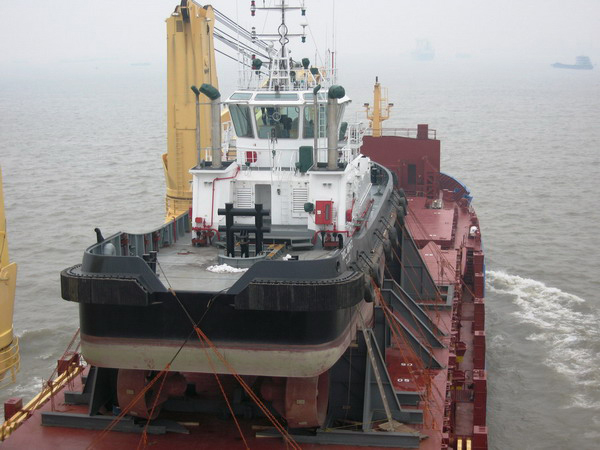 • Cargo – 460 ton Tug vessel. • Project – Design lifting lugs & transport cradle. • Surveying company – BMT. 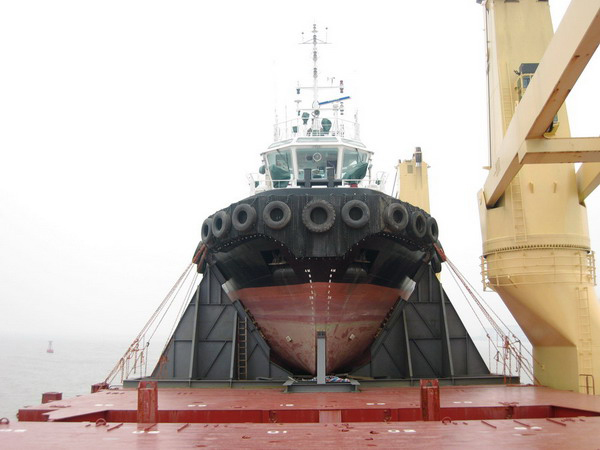 • Vessels – BBC Asia, Dwt 7500mt, 2x250t cranes. • Cradle basic principles – 5.5m and 8m height, High tensile AH36 steel. 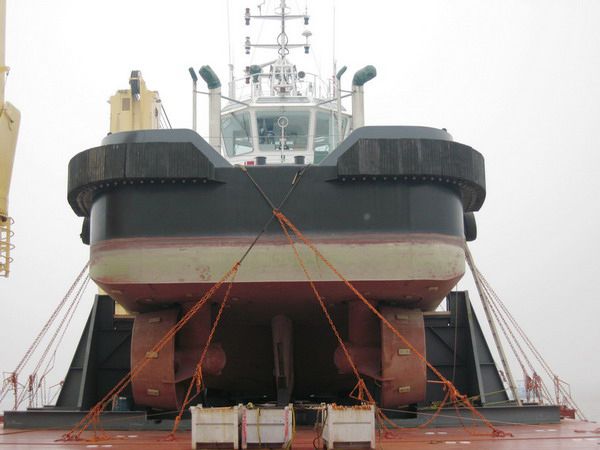 • Input – Ian Taylor & Company provided a basic GA of the 460 ton tug. • Output – With MBM’s in-house skills a 3D hull form was generated. This later enabled a close approximation for the cradle connection between the vessel and cradle contact surface to be generated. 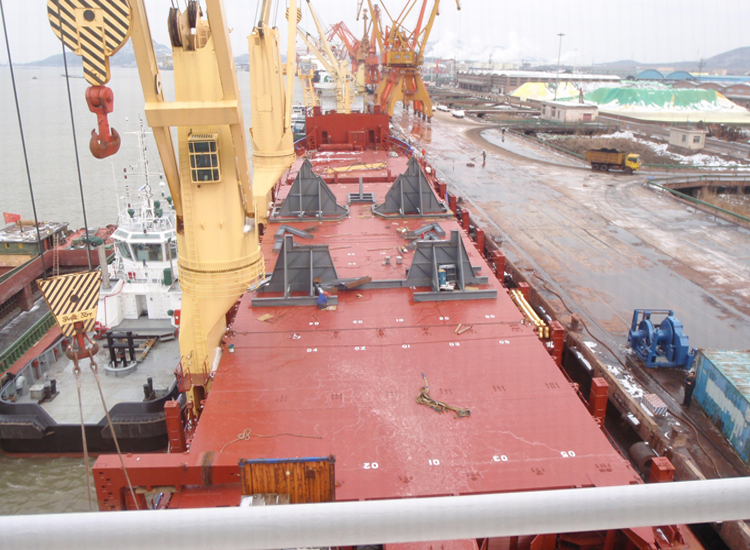 • Input – BBC provided the upcoming stowage arrangement of vessel, BBC Asia. • Output – MBM used this information to generate all vessel motions and forces expected for the cargo, and implement these onto the cradle designs and vessel structure. The results were provided in Technical reports which met the high standards of the BMT surveyors. The reports included, lifting lug calculations, structural strength calculations for the cradles, the cradle stoppers, and the hatch-covers. These structural strength calculations included the stress, strain, deflection, buckling, and weld strengths. The reports also provided the final manufacturing engineering drawings for the cradles and stoppers, and the stowage locations of the cradles to assist the Port captains during the loading operations. An analysis was requested to design a set of lifting lugs for the 460t Tug vessel. The most appropriate locations were agreed with the BMT surveyors to be the bulkheads at Frame 11 and 49. The result was a lifting lug design with cover plate using a Green pin lifting shackle. The MBM designed lifting lugs port & stbd at Frame 11 with a Green pin shackles. The 460ton Tug vessel being loaded successfully.